Civil Engineering: What are smart motorways? Smart motorway technology is deployed to actively manage traffic flows and optimise the motorway network. Why do we need Smart Motorways? The key aim of Smart Motorways is to reduce congestion and improve journey times by better managing the traffic using roadside technology infrastructure, associated control centres, systems and operational regimes. Other benefits of differing types of Smart Motorway operational regimes have included reductions in accidents and reduced impacts on the environment associated with emissions from stationary or slow moving vehicles. How does a Smart Motorway work? Traffic conditions are monitored using vehicle detection equipment installed in or adjacent to the motorway at strategic locations. The vehicle detection equipment is linked to a Motorway Incident Detection and Automatic Signalling (MIDAS) system which analyses the data and recognizes two differing traffic conditions – Queuing Traffic or Congestion. Queue Protection and Congestion Monitoring algorithms within the MIDAS system recognise differing traffic conditions and automatically set appropriate signs and mandatory speed restrictions on signals to actively manage traffic conditions. Safety specific intervention is provided by the Queue Protection algorithm which protects the back of queueing traffic and Congestion is managed by introducing reduced speed limits to increase traffic throughput. Hard Shoulder Running uses the same systems, algorithms and mandatory signal settings as the Controlled Motorway operational regime in addition to actively managing the hard shoulder. This operational regime dynamically opens and closes the hard shoulder at peak periods to reduce congestion and increase capacity. This operational regime allows differing levels of automatic and manual intervention dependent on the traffic conditions. 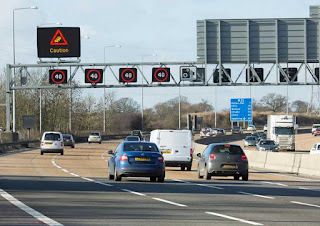 All Lanes Running schemes permanently convert the hard shoulder into an additional running lane whilst operating with all of the features, systems and signalling associated with Controlled Motorway schemes. What types of technology are used, and what do they do? Message signs are used to provide information to motorists in relation to the road conditions ahead. Where they are not co-located with individual signals some types of signs can also display Variable Mandatory Speed Limits. Signals display mandatory variable speed limits above carriageway lanes and can also be used to open or close any of the lanes, including the hard shoulder. -Pan, Tilt Zoom (PTZ) CCTV Cameras – provide comprehensive coverage of the scheme to allow operators within the control centre to monitor the extents of a scheme. -Hard Shoulder Monitoring (HSM) Cameras – Hard Shoulder Running schemes require 100% coverage of the hard shoulder which allows an operator to ensure it is completely clear of breakdowns or debris prior to dynamically opening the hard shoulder. -Inductive Loops – the traditional form of vehicle detection on motorways. They are cut into the road surface and measure the change in inductance as a vehicle travels across them to determine vehicle speed and traffic flow. -Radar Vehicle Detection – used increasingly to gather traffic parameters. They are positioned on poles adjacent to the carriageway, reducing construction requirements, removing the requirement for complex traffic management during loop cutting and also reducing ongoing maintenance requirements. To ensure motorist compliance and to realise scheme operational benefits, Highways Agency Digital Enforcement Camera System (HADECS) equipment is installed within Smart Motorways. The latest cameras can monitor all lanes of traffic simultaneously and adjust the thresholds at which they capture offences to align with the varying speed restrictions.